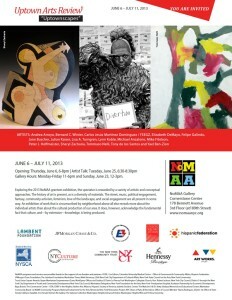 Opening Reception: Thursday 6 June, 6–8 p.m. Artist Talk: Tuesday 25 June, 6:30–8:30 p.m.
Gallery Hours: Monday–Friday 11 a.m. – 6 p.m.; Sunday 23 June, 12–3 p.m.
An exhibition of work that is circumscribed by neighborhood above all else reveals more about the individual artists than about the cultural production of our area. It does, however, acknowledge the fundamental fact that culture, and — by extension — knowledge, is being produced.